Experts say the effects of the shutdown might be felt when the busy spring break-travel season begins, and it could affect everything from airport screenings to Global Entry applications. But the worst may be yet to come. Even if the partial shutdown ends soon, it could have a ripple effect that’s felt into the busy spring break-travel season and beyond. It threatens to touch every aspect of travel, including hotels and restaurants. Now is the time to prepare for it. The shutdown is costing the tourism industry more than $100 million a day, according to an analysis by the U.S. Travel Association. It includes nearly $50 million a day in direct domestic travel spending and more than $50 million in indirect and induced travel-related output, according to the trade group. Delta Air Lines says the shutdown will cost it $25 million this month. Often, these costs are passed along to consumers in the form of higher prices. There have been scattered reports of disruptions. This month, air travelers reported longer screening lines in Atlanta and Houston. In response, the Transportation Security Administration issued a rare statement with internally reported screening times, which showed 99 percent of passengers waited less than 30 minutes to clear security on a Monday. Mikah Meyer contacted me before boarding a flight to Guam to visit the War in the Pacific National Historical Park. It’s part of his attempt to become the youngest person to visit all 418 National Park Service sites. But among travelers, there seems to be a consensus that the shutdown has had little or no effect — yet. John Sousa, who works for a financial-services firm in Farmington, Connecticut, reports that the Delta terminal in Hartford was a “ghost town” on a recent Monday morning, with no lines at the TSA screening area. Patricia Schultz, an author and frequent air traveler, flew from New York’s LaGuardia Airport to Chicago this month. She arrived at the terminal three hours ahead, expecting “the worst.” Instead, she found TSA wait times were about the same. Same thing for her return flight — everything normal. “Surprised on both ends,” she adds. Carolyn Brown flew from Philadelphia to Miami on a recent Friday. “Absolutely no wait in either PreCheck or regular line,” says Brown, who edits a travel website. “Shocked,” she adds. But the real shock may be just ahead. January is typically the slowest time of the year for almost any type of travel in the United States. 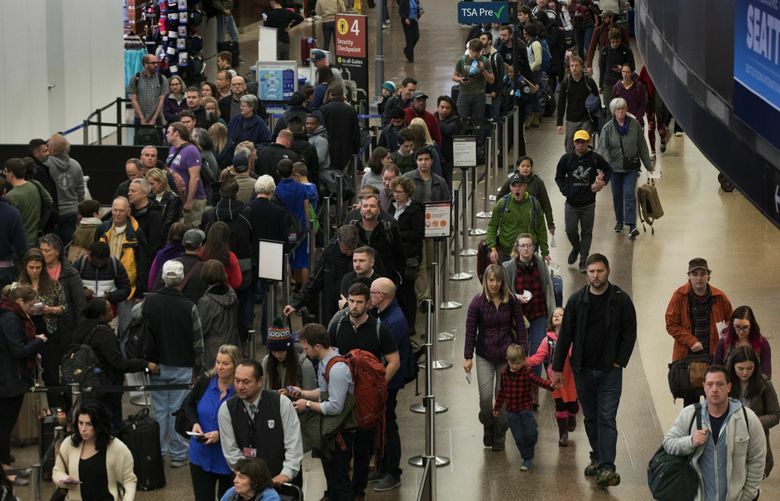 So a few TSA agents calling in sick are unlikely to affect the overall speed of screenings. Experts say the effects of the shutdown might be felt when the busy spring break-travel season begins. That’s not all. Take the Smithsonian museums and zoo and the national parks. After the shutdown ends, it could take weeks before some of these facilities are fully operational. That could affect spring trips to national parks and to Washington, D.C.
It’s difficult to prepare for the ripple effects. Most travelers are doing nothing more than worrying, which is not an effective strategy. Gray, the fiscal-policy expert, says travelers will have to go the “extra mile” during and after the shutdown. Anytime your trip touches the federal system — whether you’re being screened at the airport, applying for a passport or Global Entry credentials, or passing through customs — Gray advises that you expect delays. Those are the easy ones to anticipate. Knowing how the shutdown will affect the rest of your travel experience may be impossible — until you start your journey.